Located along Historic Route 66 in the panhandle of Montgomery County, Illinois, the Shrine of Our Lady of the Highways has watched over travelers along the Mother Road and Interstate 55 since the late 1950’s. While much of the pavement of Route 66 has been returned to the fields of rural Central Illinois, the Shrine remains as a testament to the weary traveler and Mother Mary’s guidance and protection over the highway and her travelers. The Carrara Marble Statue of Our Lady of Lourdes from Italy was originally constructed as a high school project. 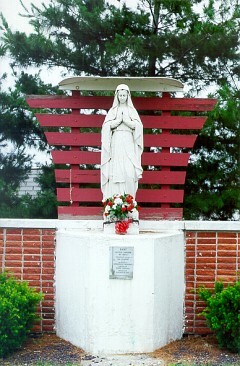 It is inscribed “Mary, Loving Mother of Jesus, Protect us on the Highway”. Also along the road from this site is a trail of Burma Shave type signs of the Hail Mary.